Peru is a classic backpackers country, the centrepiece, the main attraction, what everyone comes for is Machu Picchu however there’s plenty to offer around the country. Below is a small guide and information about Peru which you’ll hopefully find useful. Also are the blog posts about Peru from our time there back in June 2011. If you have any updates or would like to add information to this page please contact us or leave a comment. Similar to other South American countries there’s no fee for UK residents. Generally you’ll get a 90 day visa but it does vary according to how you arrive. More information can be found at – http://www.fco.gov.uk/en/travel-and-living-abroad/travel-advice-by-country/south-america/peru1#entryRequirements. There’s a total of 5 international airports in Peru however the majority of traffic comes in via the main airport in the capital Lima the Jorge Chávez International Airport. Other airports such as Arequipa, Cusco, Loreto and Piura have international flights but generally only from surrounding countries. If you’re coming from another continent then you’re looking at landing in Lima, then catching a second flight to another city or start travelling by road. For an up to date list of Airlines and Destinations check out the Wikipeadia page for the airport in Lima. The main domestic and international flights are with LAN, Star Peru and Taca. There’s not a huge network of rail links in the country but there’s a few options. The main train link you’ll get to go on is Cusco to Machu Picchu. The train is a good option if you’re not doing the Inca Trail or as a way back from the Inca Trail. The other two routes are Cusco to Puno which is in the south at Lake Titicaca, and Cusco to Huancayo which is just east of Lima. If you’re interested in using rail network in Peru then I would suggest heading over to http://www.seat61.com/Peru.htm which is a great site with information all about train travel in most countries around the world. Buses in Peru are to a good standard in relation to the rest of the world. You’re going to be able to find air con buses relatively new for shorter journeys (0-6 hours). While for overnight or all day buses you can get bed like buses (semi-cama or cama), with meals, toilets, TV’s etc. Prices are reasonable, no way near to the prices in Argentina. You can vary your price by the type of seat and the type of company (see below). You need to ask at the counter. A few tips about the buses in Peru. Overnight buses can get cold as you’ll be travelling higher up, the higher you go the colder it gets. You might get a blanket but have some extra layers just incase. Buy tickets from the bus company direct, either get the ticket from the bus depot or from an office. Unlike Asia there are not many companies that will book your ticket for you and take a commission. If there are there’s no commission they add a booking fee making it more expensive. You pay more for the type of seat, there are normally three options no-cama, semi-cama, full-cama. Cama means bed in spanish and options relate to the type of seat. No-cama is just a seat, it might recline a bit, semi cama reclines to a decent angle and you might get a foot rest. Full cama the seat reclines to almost 180 degrees flat and you’ll have a foot-rest. It changes from company to company but that’s the general rule. The prices are cheaper with the normal seat compared to full cama being the most expensive. If you’re on an overnight bus take some supplies, people will jump on the bus to sell food and water or you might get a meal but best to take some crackers or some Inca cola (you’ll find out what that is when you get there). Often the buses don’t stop apart from drop offs and then it’s only a quick stop leaving no time for shopping. You’ll need your passport when booking the bus so remember to take it when booking, you might even get the strange experience of being video recorded onto the bus. It’s a safety process or just for checking the number of tickets sold? Anyway when we got on a bus John thought he was part of a new TV commercial and started to wave and smile! It can be dangerous on the buses due to crashes, many of the routes do go along mountain passes, buses crash but there’s not an abnormal amount of crashes compared to other countries. I’ve listed some companies with the area’s they service. If any links are broken or missing leave a comment or get in touch. It’s pretty hilly, but the road network is in a good state, there are companies offering cycling tours in Peru, we’ve not come across any cycling blogs, if you have one email us and we’ll add a link. Hostels are good in Peru, some really social places, nice people and a real mix from super hostels to some nicer run family hostels. Booking is sometimes a necessity due to the high season or weekends. You might be ok not booking or you might end up walking around trying to find a hostel in the middle of the night which is never fun. There’s a few large chain hostels such as Pariwana, Flying Dog, Loki etc, you might want to avoid or book. The standards are pretty good, due to the size of them. 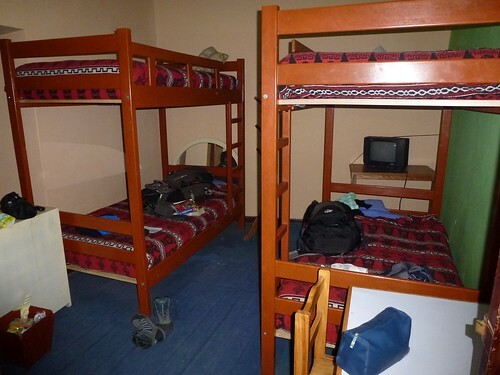 For example the beds and the showers in the Pariwana Hostel Cusco are great, but it’s huge which can make it hard to meet people or rest up. Smaller hostels will have a nice family atmosphere, you’ll meet characters but they can’t afford to have the best facilities. Prices tend to range from £3.80 up to £9 a night for a dorm bed. Whereas for a private room it’s anywhere from £5 to £10 at the time of writing. There’s not much in way of bargaining as you would do in Asia but you can get discount by booking for 4 days with a 5th free or getting a free tour etc. 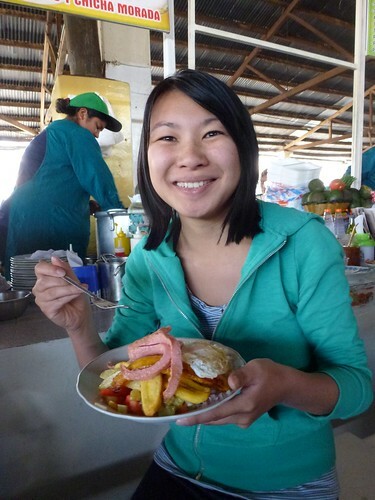 The majority of hostels in Peru don’t have kitchens as it’s often cheaper (market food and street food) to eat out than buy all the ingredients. However if you need to cook some hostels do have kitchens but you’ll need to check before hand and don’t expect there to a huge selection of mixed herbs and pasta that’s been left by someone. Many hostels will provide a small breakfast of bread and hot drinks, nothing amazing but good for a quick snack or a drink in the afternoon. If you’re looking to book then either try going direct to the hostels site. The other option is to use Hostel Bookers or Hostel World to book hostels ahead of time. If you’re uncertain about a hostel, always book for 1 night to start and see how it goes before extending your stay. You can book from either of the search boxes below or just have a browse of hostels. It’s free most of the time in the hostels however don’t plan on trying to play HD clips on YouTube or be uploading photos as it’s often really slow. If you need the internet for something critical e.g. work, then head to an internet cafe. Most of the hostels had wi-fi and a computer to use. A typical market meal in Peru, Chips, Rice, fried egg and a sausage! Peru has good cheap food. There’s the influence of Spanish and American food but there’s are some local dishes you must try. Add the following to your list and tick them off. – Alpaca and Llama meat – Used similar to beef, you can have it in chunks, steak, stews etc. Very lean and good for you. – Cuy (Guinea Pig) – You used to have one as a pet now you’re ready to eat it. Slightly expensive compared to other meals but good to try in a group. Often served whole on a plate split in two. – Market Value Meals – the meals in the markets tend to be a combination of chips, rice, salad, a type of meat and fried egg on top. Always a fried egg. Several of the cities and towns have markets with eating sections, the one is Cusco is a good place to start as they have pictures of the food, point and say “uno”. – Corn and Potatoes – Lots and lots of corn, in total around 35 varieties so expect to have type of corn in many meals. Same with potatoes, lots of amazing colours. Similar to other South American countries there’s plenty of regional beers from town to town. Listed below are some we’ve sampled. Cusquena – Beer of the Incas! It’s been successfully exported around the world but you can get in Cusco and it’s a bit cheaper than buying it in Tesco! 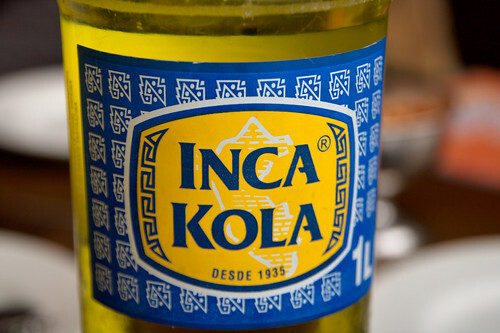 Inca Cola – You can get addicted to this stuff, looks like piss, but doesn’t taste like it. A kind of bubble gum flavour but very similar to Iron Bru a drink from Scotland. You’ll be wishing you shipped litre of the stuff home. There’s plenty to do in Arequipa, either in the city or in the surrounding area. The central square (Plaza de Armas – most squares in South America are called Plaza de Armas) is a really nice to hang out during the day and admire the volcanoes that overlook the city. There’s great museum in the centre called the Museo Santuarios Andinos where you can see Juanita the Mummy. She’s a frozen inca mummy who was found at the top of a volcano, she’s only there May to November so time your visit. The market was also entertaining and good for some shopping as prices where a little cheaper than Cusco. Outside the city you can get to the Colca Canyon to see the views and the condors. You can go on a day trip which we did or longer stays. Of your feeling active you hike there, or climb a volcano nearby to Arequipa or even some white water rafting. A great place, and the above is only a small selection of whats on offer. Day 6 – …and breathe! Day 9 – Hello Tom!